Remember ELO? Not if your under mid 40s. But if you’re younger and in Malta, you might be familiar with a local acronym that also alludes to electric: ELP, or Electro Lobster Project in full. ELP – restaurant, bar, lounge and cafe’ by day, as well as an events and gigs venue – is as much a fusion concept of classic and ultra-modern as Electric Light Orchestra was in its day. ELP’s music scene is of course light years away from the 70s. Located on Balluta Bay on the ground floor of Art Deco landmark Balluta Buildings, ELP is a relative newcomer on the food-concept scene, but has been making inroads into our consciousness steadily over the past year as it develops and decides where its strengths lie. And where to focus won’t be easy. It’s clearly becoming a serious food contender: think slow food care and detail meets ace classic and traditional fish and seafood. But it is also known with another crowd for its below stairs venue spaces and its lounge bar. It summer cocktails aside, the lounge-bar is aiming to boast the most extensive whiskey selection on the islands along with an extraordinarily large choice of spirits like vodka, tequila, gin and rum. The acronym also reads as ‘Eat, Listen, Play’, which sums up the three strands of the project. Electro refers to the main design element of the space, which is the 250 old-style light-bulbs inside the club. Lobster is for the simple reason that lobster is the house specialty. Browse your potential dinner in the newly-installed huge aquarium. Project was added to remind owner Matthew Marshall that the place should constantly change and adapt in pursuit of quality. Matthew is also owner of Badass Burgers and is the creator of Str.Eat Whiskey Bar and Badass Cafe in Valletta. He’s almost a serial creator of food and drink experiences on the islands. I had a chance to experience the food side of ELP on a night out dining in July. Credit to the chef who manages to make fish innovative without deviating from the cardinal rule which says fish needs few frills and should be simply served. Tomaso, our Sicilian-Maltese maitre d’ knew the extensive menu and his fish well. 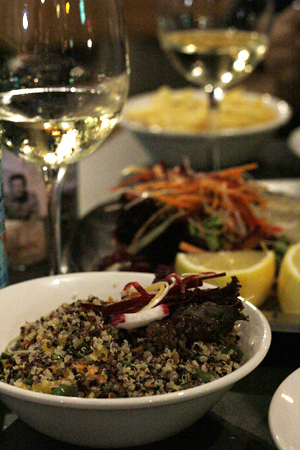 He recommended starting with a deep-fried Lipp (Blue Ling)* served with truffle oil chips and quinoa salad – a speciality – as sides. It’s how lampuka is traditionally cooked, but unusual to find that method used on other fish. It was the most delicious fish ‘n’ chips I’ve had in a long time and was a meal in itself rather than a starter. However, ELP is not all about fish, so Tomaso persuaded me to a secondo of pan-fried beef fillet with cloves, garlic & rosemary, cooked in heady red wine reduction and topped with Cacio Cavallo cheese. The husband had a special of local oysters (apparently sweeter and smaller than Italian cousins) in a spaghetti marinara. Both were excellent – no chewy oysters – they were definitely fresh-plucked from the sea that day; and my steak was seared to a perfect medium rare. Vegetarians and vegans might be losing the plot by now, but rest assured that Electro Lobster Project does you proud. In fact, on a return visit, I’d probably opt for something along the lines of their grilled rosemary polenta with sauteed mixed mushrooms & truffle sauce on a bed of green lentils or the Prosecco & beetroot carnaroli risotto, topped with ricotta salata. Both these dishes give you a sense of the fusion of traditional Maltese-Sicilian with contemporary flair. And there’s even a vegan, organic wine range. An ace restaurant is a seamless blend of several elements – food, atmosphere, location, service, value and more. Just a final word about location and atmosphere as the service of Tomaso and team was superb. 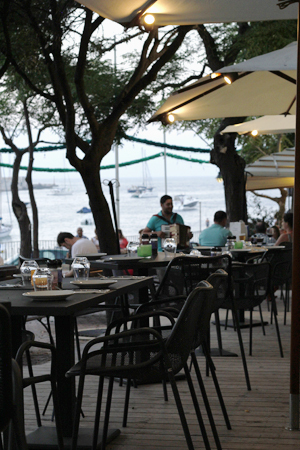 With ELP on Balluta Bay, its tables edging the pjazza, you can dine overlooking a slice of local life playing out before you. This is one of the few gems left in what is an increasingly urban, modern city-scape. The constant movement on the main drag of the seafront is out of sight and sound, almost. You feel cocooned in the square, and able to enjoy your meal in peace with just the chatter of locals out on the benches taking the air. ELP outside on a summer night is one of the season’s pleasures. What the Project has in store in winter is another story and one about the interior of the spectacular Balluta Buildings, spirits and a programme of gigs. * Great resource list of Maltese names for Mediterranean fish translated into English and Italian.